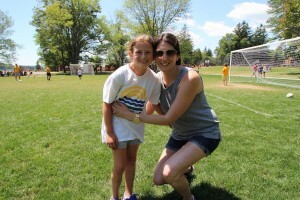 If you are like many camp parents, it is easy to get caught up in the Visiting Day hoopla. When did Visiting Day go from bringing ritz crackers and spray cheese to window shopping through endless Instagram photos of gifts and baskets and cellophane-wrapped camp-themed goodies? 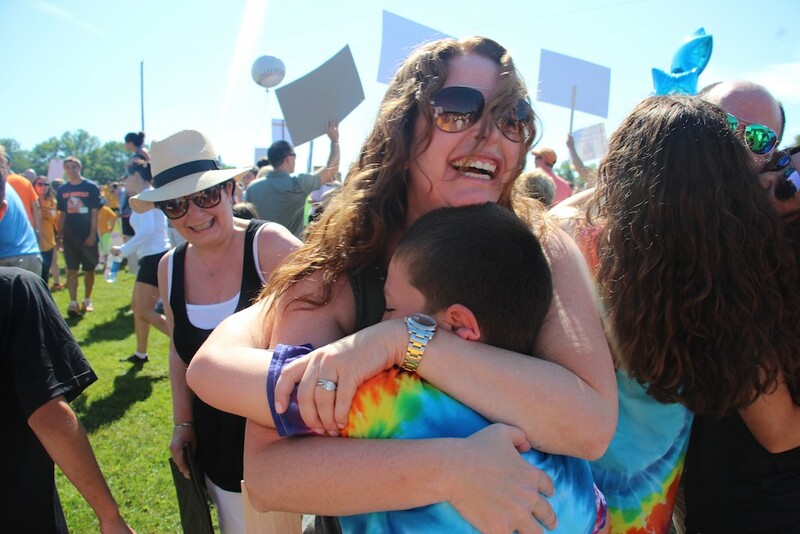 Visiting Day fever is a real thing that parents can catch (and it seems contagious)! It’s even in the news. As you pack up your cars this Saturday and head for the hills of Honesdale, please remember that the real gift IS camp. It was only just 4 weeks ago that you shipped off your camper with trunks full of clothing, new camp swag and the promise of an amazing summer. Your campers have not forgotten how lucky they are. They are well-fed and enjoying canteen, dippin’ dots, birthday cake, milk & cookies, and trip day treats! They are sharing their clothes with their groupmates (which means they have 10x the clothes they even need!). They are learning how to spend unstructured time, unplugged with simple games, tetherball and jacks. 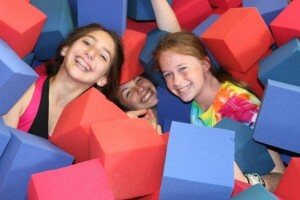 They are busy cherishing every moment they have at camp with their summer family. They are also learning through our community service that not everyone gets this incredible opportunity. And most importantly, they know none of this would be possible without the amazing gift of camp that you already gave them. So bring up some of their favorite comforts from home (maybe a NYC bagel or some Dunkin Donuts…you can leave the sushi behind!). And remember the day is really all about one thing. It’s not about toys, or bunk gifts (which we don’t allow), or endless amounts of candy (that they won’t have time to eat). It’s about your camper showing off THEIR camp, their friends, their counselors, their experience. 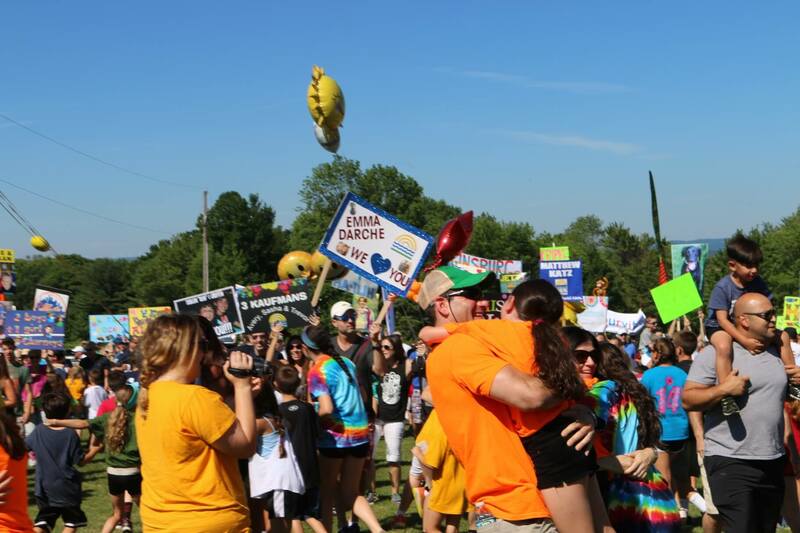 It’s about seeing Towanda all over again through the eyes of your camper. It’s about pride, love and a taste of home. It’s about getting a peek into their world and then walking away for them to experience the best that is yet to come. And it’s about knowing they are growing, learning and ready to take on the next 3 weeks. As you drive away on Saturday afternoon, you can feel amazing knowing that the best gift you gave your camper wasn’t wrapped in cellophane… it is the gift of camp! It is the gift that keeps on giving! A few weeks ago, The W.O.C. (aka our Winter Office Crew), Stephanie and I attended the annual American Camping Association Tri-State conference (hey, I’m on the Board of Directors). The conference is an opportunity for us to hit pause on the camp countdown and learn with industry experts about the camping business and child development…and buy some cool new toys for the summer at the expo. We all split up to attend different sessions throughout the 3 days- topics like “Working with Millennials”, The Importance of Teaching Character, Values and Community”, “Planning for the Unexpected”, “What to Expect When You’re Expecting Middle Schoolers”, “Teaching Your Staff How to Build Powerful and Positive Relationships with Campers” and so much more. We also met for the keynote speaker who was Susan Cain – TED speaker and author of the book “Quiet: The Power of Introverts in a World That Can’t Stop Talking”. 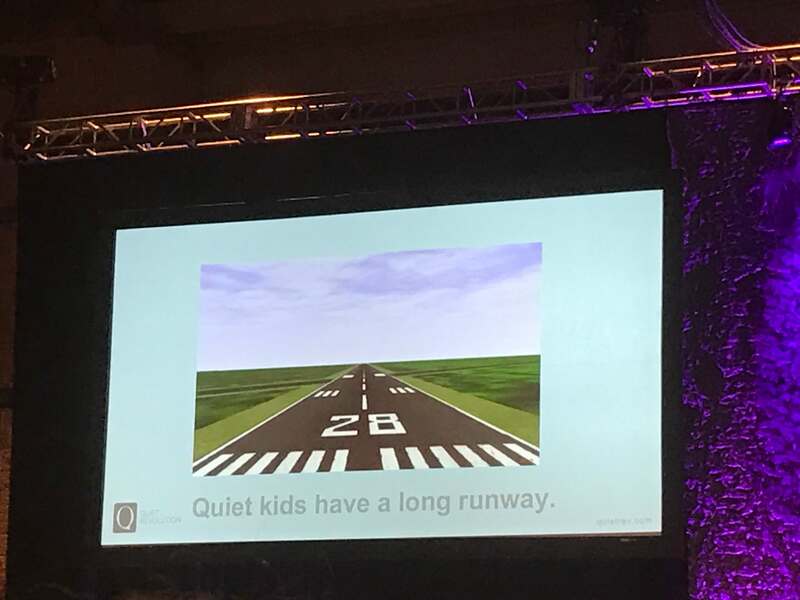 Susan Cain started off her speech with a story about going to sleepaway camp as a young girl. Her mother packed her trunk full of books to enjoy during all the quiet times at camp. But she remembers being criticized for reading, not being social and lacking “camp spirit”. In fact, she humorously shared a defining moment when her campmates cheered “R-O-W-D-I-E” (you know the cheer!) and realized that to be successful at this camp, she too would have to be ROWDIE. When Susan Cain got older and wiser, she came to the realization that not everyone is rowdy by nature. And that they should be encouraged to step out of their comfort zone without stepping outside of themselves. Her enlightening speech talked about three kinds of people: Introverts, Extroverts and Ambiverts (those who are in between). See definitions below. 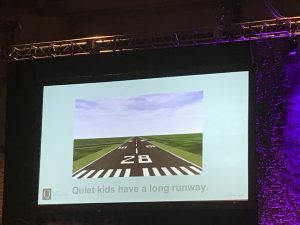 One out of every two or three kids (and staff) is an introvert. That’s half to a third of the population. Camp is a place full of spirit, energy and “rowdiness”. But it can also be a place of creativity, reflection and serenity. Understanding what makes introverts and extroverts different, can help us at camp (and in life) create an environment and appreciation for how to get the most out of everyone. Susan Cain changed our perspective and helped us better understand “the shy child”, who really may not be shy at all. Do you have a child that you have said “it just takes longer for them to warm up”? They may be an introvert or ambivert. Because while the extrovert jumps into the situation (sometimes unaware of the risks or surroundings), the introvert “has a longer runway”. Introverts step back, assess the situation, the risks, the personalities and quietly wait until there is water in the pool before he or she jumps in. 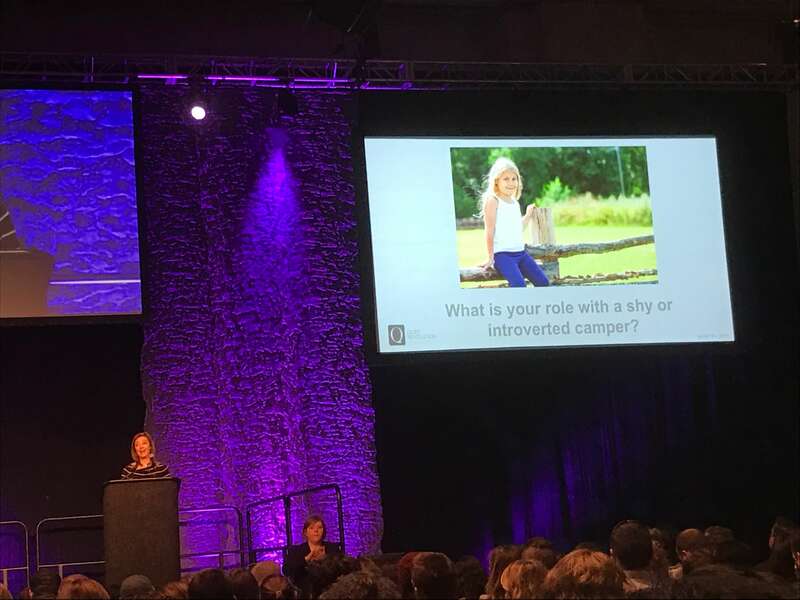 What we learned from Susan Cain is to rethink the “shy child” and celebrate the wonderful qualities of the introvert, the extrovert and the ambivert. One is not better than the other…it’s just their style and part of who they are at the core. Each style has it’s positives and drawbacks. Understanding the introvert, extrovert and ambivert liberates us from pigeonholing anyone. Camp allows all three of these personalities to find their way, be comfortable in who they are and blossom into their full potential. We look forward to sharing Susan Cain’s insights this summer at our staff orientation. In addition to our campers, “Quiet” will help us appreciate what makes our staff tick. You can watch Susan Cain’s TED talk here. You can also take Cain’s “Quiet Quiz” . Where do you fall on the introvert/extrovert spectrum? Does your result surprise you? You relish social life and are energized by interacting with friends and strangers alike. You’re assertive, go-getting, and able to seize the day. You’re great at thinking on your feet and relatively comfortable with conflict. Given the choice, you usually prefer more stimulating environments that give you frequent opportunities to see and speak with others. When you’re in quiet environments, you’re prone to feeling bored and restless. You’re actively engaged in the world around you and at your best when you tap into its energy. Ambiverts fall smack in the middle of the introvert-extrovert spectrum. In many ways, ambiverts have the best of both worlds, able to tap into the strengths of both introverts and extroverts as needed. Camp Towanda is an independent, traditional, co-ed sleep-away camp in the Poconos in Pennsylvania. It is privately owned, operated and directed by Mitch and Stephanie Reiter (who are celebrating 27 years as owners and directors). 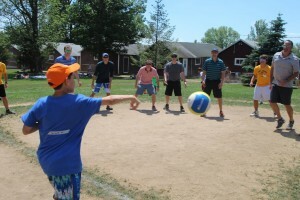 For over 90 years, Camp Towanda has continued to define what camp should really be. Our program offers state-of-the-art facilities, an excellent and professional athletic department, waterfront, extensive arts, drama and adventure programs, and special events. We are highly regarded and respected as an industry leader and are involved in giving back to various organizations throughout the year. Camp Towanda is accredited by the American Camp Association and a member of the Camp-Alert-Network, Wayne County Camp Association, Camp Owners and Directors Association and the Pennsylvania Camp Association. 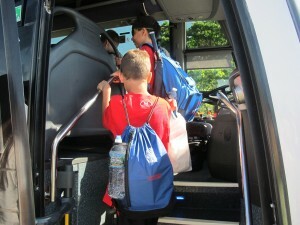 Parents don’t always realize how intense the build-up to camp is until their campers flee the nest. For the past 6+ months you have been talking about camp, not talking about camp, shopping for camp, labeling for camp, practicing goodbyes, packing trunks, and just about everything in between, to prepare for the day the busses pulled away. With all that preparation, you must have been ready for them to go, right? You thought so, and then the silence set in. No more bed to make, no more reminders to brush their teeth, do their homework, schlep them to activities. No more talking with coaches and teachers about their progress, no more extensive grocery shopping lists and no more smelly socks to wash. So now what? It gets so much easier. We bet you didn’t realize that your world has been on HIGH SPEED for the past few months leading up to camp. The sudden halt is abrupt. But while you are hearing the sounds of silence, we are hearing the screaming, cheering, laughing, cheering, cheering, cheering…. And all this amazing energy and spirit wouldn’t happen if you were here, because that is the magic of camp. However, after a few days, you will get the hang of being on your own and start to enjoy the break that you deserve. The summer moves pretty fast. If you don’t stop and enjoy it, you could miss it. They will be back before you know it! Trust the system. This is not the first rodeo for Mitch, Stephanie, Amy, Bobby and our incredible Senior Staff. They have seen and lived through almost every scenario you could possibly imagine, and are ready to handle those that come their way. The Towanda philosophy about bunk dynamics, bunk life and the communication with parents comes from decades of combined experience. No decision is taken lightly. It is all FTGOC (For the Good of the Camp & For the Good of the Camper). Towanda is not like other camps. 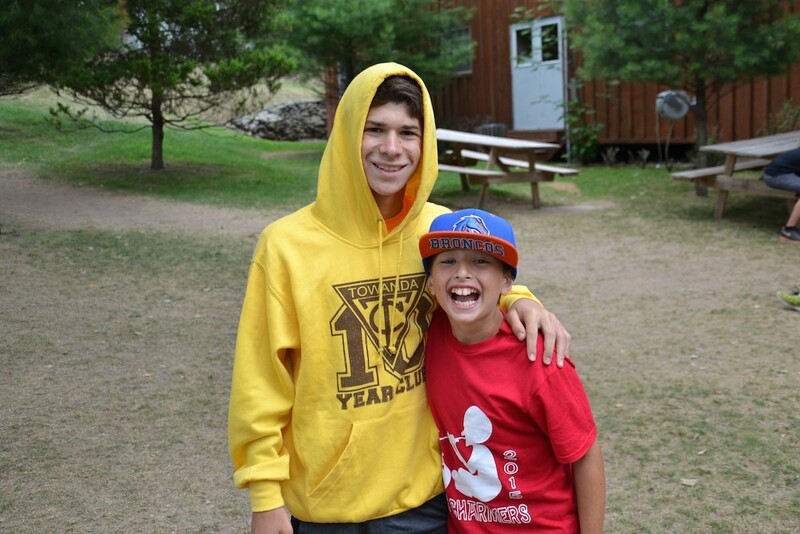 Everything we do is to help your camper grow into an independent, healthy, confident person. That’s our big picture goal. We care about not just this summer, but the summers and years to come. Your camper will benefit in the long run. Watch how they blossom. See what motivates and interests THEM. Enjoy learning about what choices they make. Sit back and find out how they deal with challenges that come their way. You have given them so many tools, love and support. Trust in them. And trust in the fresh perspectives they will get here at camp. We will not let them fall. We’ve got this! You’ve got this! Can you believe the campers come home this week?! Where did the summer go? As you anxiously await their arrival by bus, plane or car, it’s good to think about where they are really coming from- emotionally. No more homesickness, but now they are campsick. Remember when you told them that it’s okay to be homesick because that means they have a home that they love? Well, now get ready for campsickness. Camp is now their happy place, filled with cozy memories of friendship, family and fun. Just like homesickness, they will acclimate and get back into the swing of things. They just need time, space and the support of friends and family. They mostly want to connect with their camp friends. Even though you may think they want to be with their home friends who they haven’t seen in weeks, you will probably find your campers texting, chatting and connecting with the friends they just left behind. 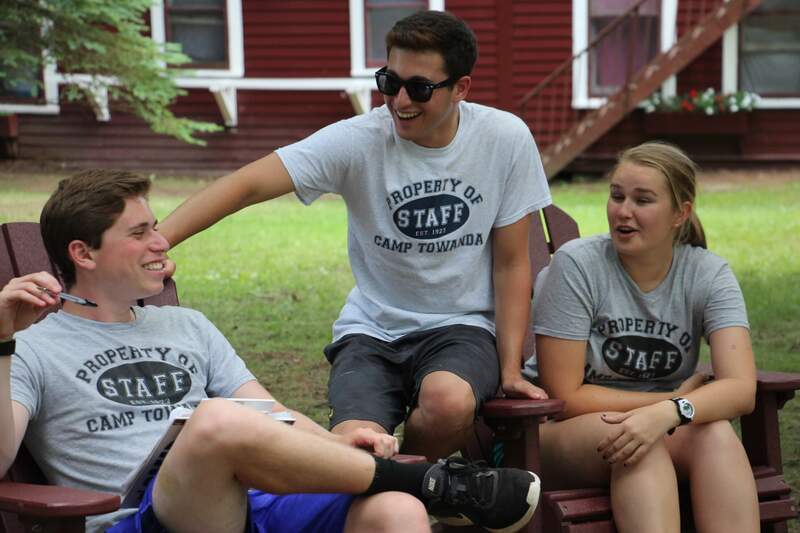 The inside jokes, the rich experiences and life at Camp Towanda are only things they understand together. Their camp friends actually help make the transition easier if they can share, laugh and keep up their friendships in the “off season”. They have manners and responsibility. 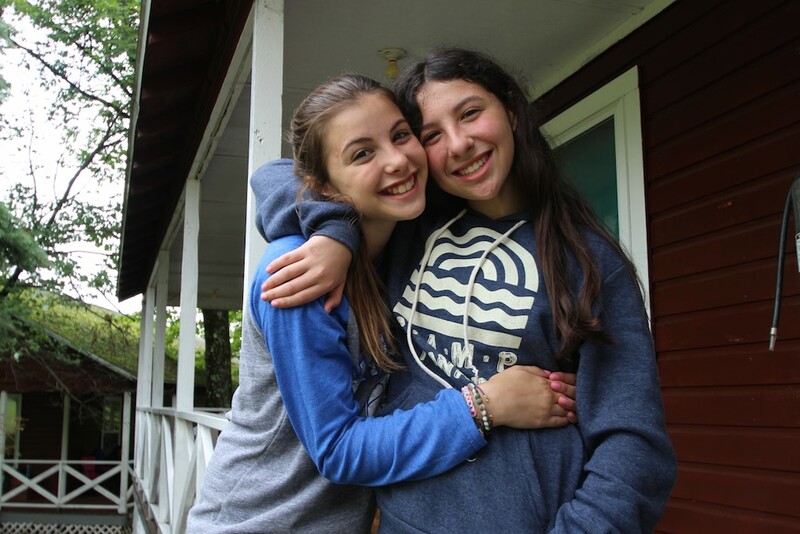 At camp, we expect a lot of our campers in order to live together in harmony. They will come home wanting to make their beds and help with chores. Use this as an incredible opportunity and a gift to start off the school year on a great note! Even if their bed isn’t made perfectly, or all of their clothes don’t end up in the hamper, empower them with these jobs and reward their motivation to contribute and help their home family. They haven’t touched a remote control in weeks! Card games, diablos, yo yos and books have replaced their devices (or appendages) for the summer. It’s a great time to dial back the dependance on electronics. Carve out an hour of the day and call it “camp time”. Have them enjoy technology-free eating, an old fashioned family board game or face-to-face conversation. They can do it! Trust us..when they are unplugged, they function even better! Before long, you will feel like they were never gone. Parenting is tough and don’t let it wear you down. Keep up the good work and try to make the magic of camp last beyond October. Before you know it, it will be June again! And we can’t wait to have our summer kids back. We already miss them and they haven’t even left yet. Here’s another great blog from last summer about homecoming. You can never be too prepared. Here at Camp Towanda, we have an expression, “Don’t forget your sunscreen”. Of course this applies to when the kids are at camp. But as you head to the bus stop or airport this weekend to drop off your precious cargo, ”Don’t forget your sunglasses”. Yes, even you tough dads who insist you were ready to let them go yesterday? These are the ones that we hear break down first. And that’s okay because really, it’s a big deal that they are going off to camp. Whether it is their first summer or their eighth, getting on that bus is a big step in healthy independence, self-discovery and personal growth. You will see a different child emerge from the bus in just 7 weeks. And that’s a good thing! Celebrate this week as a huge accomplishment for both them and YOU. You are the ones who have made it this far as their parents and love them that much that you are willing to let them go for just a few weeks so they can return stronger, smarter, happier and more self-assured. You are the ones that recognize that camp is the one place that can cure sleepless nights, shyness, homesickness, stage fright, swimming in the deep end, picky eating and more! You are the ones that appreciate that camp is a privilege and the best gift you can give your child. You are the ones that know that no matter what that first letter home says, this is an experience that will help your child learn how to cope in their own hands for the rest of their life! You are the ones that deserve a break from parenting 24/7, so please take this time and enjoy your summer. You are the ones that chose Camp Towanda as a safe, nurturing summer haven for your kids. We take this trust very seriously. 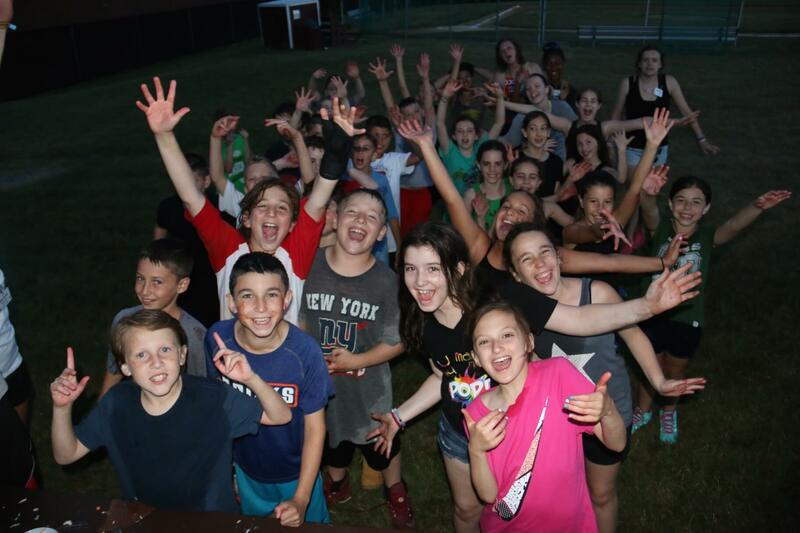 We hope you enjoy a glimpse into life at camp through Friday Nite Flix, the photos and the Live Camp Cam, but please do not plan your days around the photos or hope to see a glimpse of your child’s left arm on the camp cam. They will be living life up at camp. We hope you are doing the same at home! The summer will fly by and before you know it, you will be here at Visiting Day. You are the ones that have made these amazing kids into the kind of camper that will thrive at Camp Towanda. And you are the ones that need to remember your sunglasses. Because you should be beaming with joy, pride and gratitude as you see your kids step on that bus. You should be proud of them…but you should be pretty proud of yourselves too!!! See you on Visiting Day! P.S. Don’t forget your sunscreen. Of course at camp, there are opportunities for kids to make good friends, build confidence, independence, unplug and reconnect with nature. 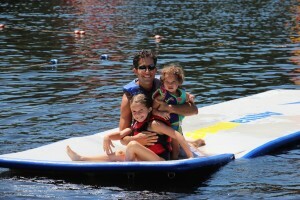 These are many of the reasons that parents initially consider camp for the summer. But what camp builds even better than school are the 21st century skills needed for success in today’s world. The Partnership for 21st Century Skills reports that academic institutions and employers are seeking candidates with skills like communication, collaboration, critical thinking, creativity, grit, self-control, optimism and leadership. Look no further than camp! Which got us thinking about a bigger idea than camp creates advantage… camp is for life. Camp is the one place that prepares you for the real world, even though it may seemingly be nestled in the woods, tucked away from reality. At camp, you live in a bunk with a dozen campers and staff and you need to find common ground and learn how to get on the same page. You learn how to make decisions as a group and work (and live) with people who may be different than you. You learn to tackle challenges as a team, wait your turn, advocate for yourself, create magical skits and silly songs and look at the bright side of life (every day isn’t sunny and not every day is pizza day!). You learn how to hold back when things get heated and how to make people want to work and live along side of you. All of these skills get students ready for the independent college and post-grad years and gives them confidence and coping skills that they cannot get under their parents’ roof. Why else is camp for life? Princeton’s Dean of Admissions was quoted in an article in the New York Times as saying, “If you have gone to a summer camp that you love, please return to it in the next few summers. Being a senior leader at camp or working as a counselor can be a rewarding, fulfilling and meaningful experience.” While we can appreciate all of the travel and educational opportunities that are offered to students outside of camp, camp nurtures high-quality people (a.k.a. “menches”) who will ultimately give back to their communities and make a difference in the world. And what about staff? Being a counselor at camp gives you real-world skills and then some. Camp provides endless leadership opportunities including the art of persuasion (sometimes with a group of 8 year olds), communication (with senior staff and their peers), conflict/resolution, creativity and you learn how to win friends and influence people! Which is why we loved the recent MTV news article “Why I’m a Twentysomething Who Still Goes to Summer Camp“! We strongly recommend that camp is a prominent feature of a staff member’s resume and wrote a very popular blog called “How to Make Camp Counselor The Best Thing on Your Resume.” Our former staff will certainly reiterate that camp helped them learn more about themselves than any internship or job and it helped shape the kind of employee they would become. So, revisiting the idea that “camp creates advantage.” Did you go to summer camp? How do you think it made you into the person you are today? What leadership opportunities did you get that helped you achieve your academic and professional goals? What kind of networking opportunities did your camp family provide to help you succeed? If you had a positive experience at your camp like the ones our campers and staff have at Camp Towanda, we think you will unanimously agree that camp creates advantage and camp is for life. It isn’t just about getting better at a sport or roasting s’mores. It is about so much more. 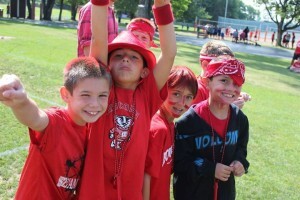 The benefit of camp is long lasting and goes well beyond the years you attend. Did camp give you an advantage? Please share in the comments. Homesick and Happy by Michael Thompson Phd. With spring in full bloom (okay, at least there is no snow), parents are busy preparing, planning, shopping and labeling in anticipation of sending their kids off to camp! While the process can be fun for kids, it can be overwhelming for parents who are experiencing this for the first time. It also is a constant reminder that the day is getting closer to put them on a bus or plane and let them experience life without you. Most of the time kids are busy being kids and don’t give a lot of thought to their excitement, fears and worries leading up to this experience away from home, unless their parents give them something to worry about. Did you know that a parent’s anxiety levels about sending their child to camp are associated with higher levels of homesickness in the child? For example, have you found yourself saying any of the following (even if it is with a wink and a smile)? Maybe their hair will be a little messy in the photos you see online, but what you didn’t see is how fast they tied their shoes and were the first down to lineup. Maybe they write a letter home saying they didn’t like the chicken at camp, but what you didn’t see is how they have a newfound love for the salad bar and spaghetti and meatballs! Maybe they didn’t play extra baseball 3x a week, but what you didn’t see is that they are too busy mastering waterskiing on the lake. And it’s okay you are missing these milestones and growing moments, because they wouldn’t happen if you were there! So as you approach the next several weeks leading up to camp, focus on the positive. Get your camper involved in the camp shopping and labeling, empower them with fun stationery for communication, talk honestly about the possibility of homesickness, make sure they have a successful sleepover or two, practice saying good bye, and keep a smile on your face (don’t let them see you cry!). 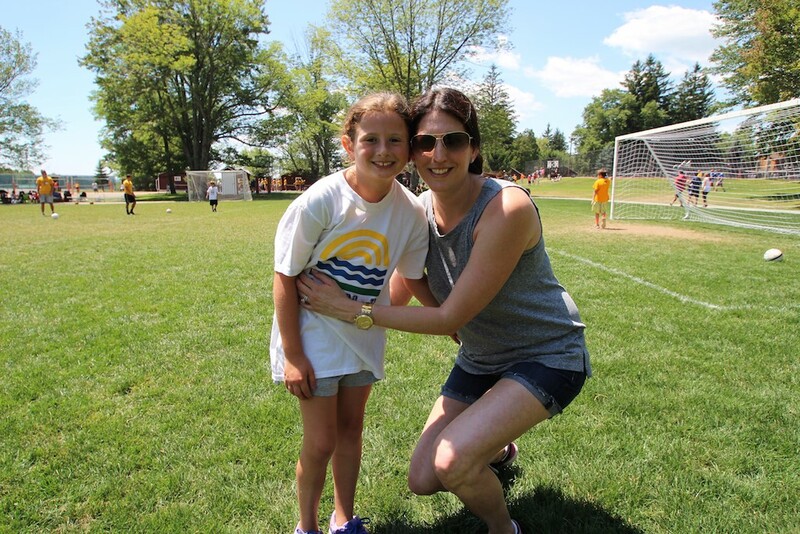 When parents put aside their own anxieties, they give children the confidence that camp is going to be an incredible learning experience for everyone! To learn more about the expressed parental anxiety and camp click here and here. Worried about the possibility of homesickness? If you haven’t read “Homesick and Happy” by Michael Thompson, PHD, we strongly recommend it to all our camp families. We also have some more great ways to prepare your child for homesickness (and parents for childsickness). 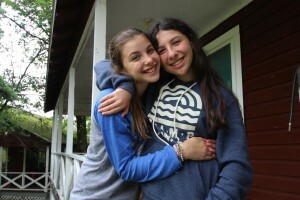 Click here to read about them on the Camp Towanda parenting blog.